Case management facilities are designed to help application developers create applications that support multi-level case relationships among work items. These new features enhance the case management capabilities of PRPC 6.3. For a complete overview of Case Management, see Case Management Overview. 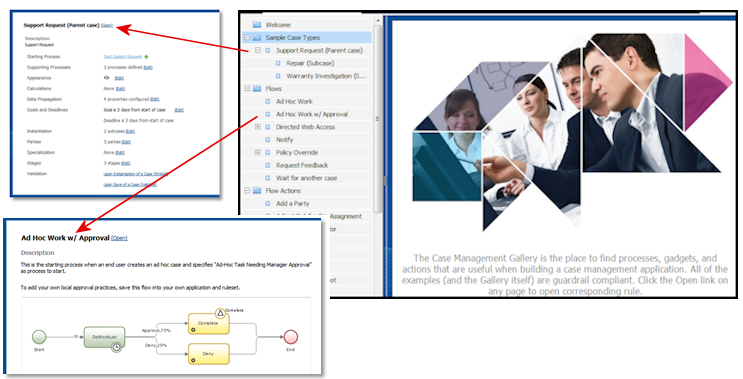 The Case Management Gallery contains a working example of a case management application that demonstrates many process and user interface capabilities. You can explore the configuration, and copy and adapt the rules into your application. Also included are descriptions and links to more than 40 standard flows, flow actions, and sections that are commonly used in case management designs. The flows and flow actions represent standard business process functions that can be rapidly implemented and customized in your applications. For additional information, see Understanding the Case Management Gallery sample application. Your application users can create, display, update and resolve cases in a separate 6.3+ PRPC system using Federated Case Management (FCM) facilities. This allows them a consolidated view of all processing affecting, for example, a specific customer or work party, even when the applications were developed independently. The control system and the remote system communicate using Internet Application Composer, which eliminates the need to create services and connectors, or replicate the applications among systems. Standard user interface components present a unified case desktop to all FCM users. The tag cloud on the Case Manager portal shows only tags associated with the currently selected application. For additional information, see Introduction to the standard tagging features for collaborative case management.